Big Bend Coffee Roasters has made a special blend to help with raising funds for The McDonald Observatory. A percentage of sales of their “NIGHT SKIES” blend will go directly to help fund this initiative. McDonald Observatory is working with neighbors in the region to help protect our dark night skies, to promote awareness of light pollution and its simple solutions. • Notice to Oil and Gas Operators – Minimizing Lighting Impacts from Oil and Gas Activities – Railroad Commission Issues Updated Notice to Operators (February 2019). • The Stars at Night: How an ordinance keeps the dark skies of west Texas dark and the stars bright – NewsWest 9 (February 2019). • UT System’s University Lands Endorses Dark Skies Initiative – The University of Texas System (January 2019). • Gas flaring lights up Texas skies amid US oil boom – Financial Times (January 2019). • Oil vs. astronomy: The race to protect the night sky in West Texas – Dallas Morning News (January 2019). • TXOGA and API Joining the Collaborative Recommended Lighting Practices– Texas Oil & Gas Association (December 2018). • Shedding (Less) Light on the Dark – Presentation to the Executive Oil Conference, Midland, TX (November 2018). • MODERNIZED OILFIELD LIGHTING PROTECTS NIGHT SKIES, BENEFITS THE INDUSTRY – Cynthia and George Mitchell Foundation blog post (September 2018). • McDonald Observatory, Oil and Gas Organizations Collaborate to Protect Night Skies – Press Release (July 9, 2018). • Recommended Lighting Practices – for OILFIELD LIGHTING (2.4 mb PDF). 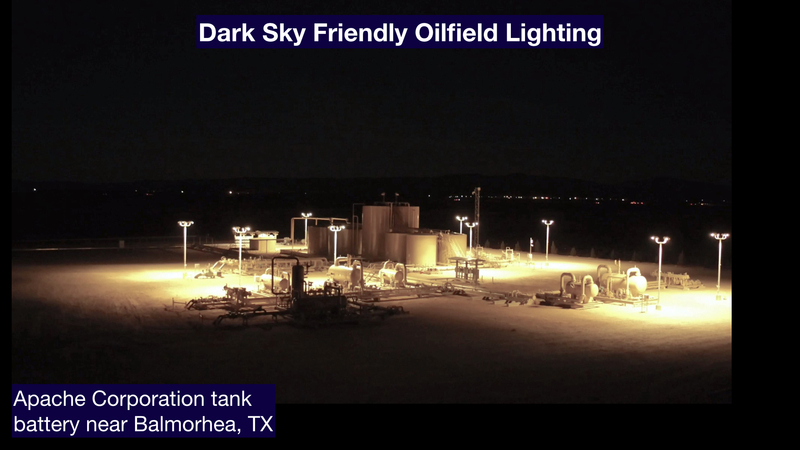 • PROTECTING THE WEST WEST TEXAS DARK SKIES – Explanatory video for Recommended Lighting Practices produced by Apache Corporation (February 2018). • Texas Collaboration Protects Dark Skies – International Dark-sky Association blog post (August 2018). • Dark Skies Initiative selected by former First Lady Laura Bush’s organization, Texan by Nature, as a 2018 Conservation Wrangler recipient. • Dark Skies and the Permian Basin oil boom – San Antonio Express News (April 2017). • When Staying in the Dark is the Brightest Idea – Permian Basin Petroleum Association Magazine (September 2017). • Railroad Commission of Texas Reminds Operators to Reduce Light Near McDonald Observatory – Railroad Commission of Texas Issues Notice to Operators (February 2016). • Upgraded Rig Lighting Improves Night Time Visibility While Reducing Stray Light and the Threat to Dark Skies in West Texas – Society of Petroleum Engineers (March 2015). • SAFETY: Vision is impaired by “glare” from overly bright light sources, reducing sensitivity to fine details and color perception, especially in elderly people. Brighter lights cause shadows to appear darker.